The cave of Otniel Ben Knaz saw 400 visitors on Tisha B'Av. 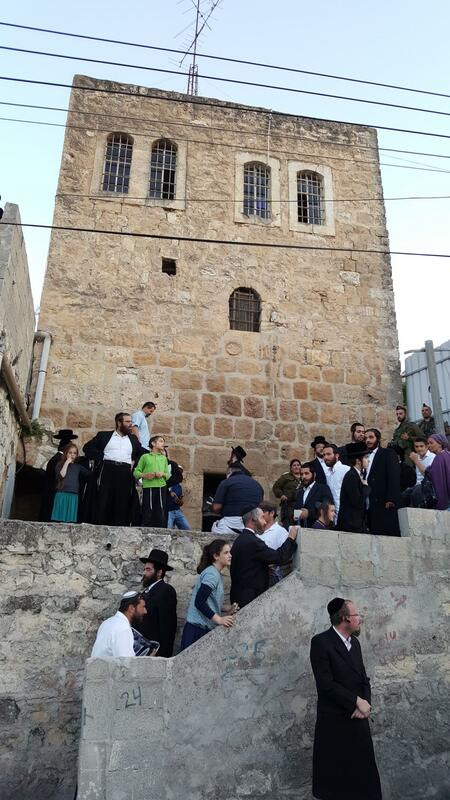 Hebron is best known as the location of the Cave of Machpela, burial site of the Jewish Matriarchs and Patriarchs. But other Biblical figures are buried in the city as well. One of these is Otniel Ben Knaz (also spelled Othniel or Osniel). Once easily accessible, the site is now off limits since the division of the city in 1997. On Sunday this week, over 400 people crossed the border from the Israeli side of Hebron into the Palestinian Authority side to break their Tisha B'Av fast at the holy site. Otniel was the first of the Biblical Judges who took command of the Jewish people after the death of Joshua. The special event was arranged in conjunction with the Israel Defense Forces and the PA. The burial chamber is located inside an old stone building, and corresponds to the specifications of Second temple Era Jewish burial practices as described in the Mishna. Today, the cave is empty, and crowds gathered to light candles and recite prayers in the dark chamber. The group recited evening prayers before breaking their fast on watermelon and crackers. Despite the 1997 Hebron Accords allowing for equal access to Jewish holy sites, this and other places in the Palestinian Authority side are off limits to Israelis except on special occasions and with prior coordination with the Israel Defense Force and the PA.